Houston based harpist Emily Klein is known for bringing a range of color to her solo, chamber, new music, and orchestral performances. In the United States and abroad, Ms. Klein has performed in venues such as Carnegie Hall, the Kimmel Center, Jones Hall, Wiener Konzerthaus (Vienna), Filharmonia Narodowa (Warsaw), and the Villa Mazzotti in Brescia, Italy. Ms. Klein made her solo debut performing Rodrigo’s Concierto de Aranjuez with the Texas Medical Center Orchestra in November 2013 at the Wortham Center. Ms. Klein is in her fourth season as Principal Harpist with Opera in the Heights (Houston, TX) and previously held the Principal Harp chair with the Orchestra of the Southern Finger Lakes (Corning, NY). Ms. Klein regularly performs with the Houston and San Antonio Symphony Orchestras and in March 2018 joined the Houston Symphony for their European Tour. Emily also collaborates with flute and harp duo, inFLUX, a group that performs on chamber music series as well as to underserved audiences throughout Houston. The 2014-2015 season marked her second year with Da Camera of Houston’s Young Artist Program. As part of the program, Ms. Klein implemented the Holocaust Music Project that combatted bullying while bringing to life musical works by composers who lost their lives during World War II. 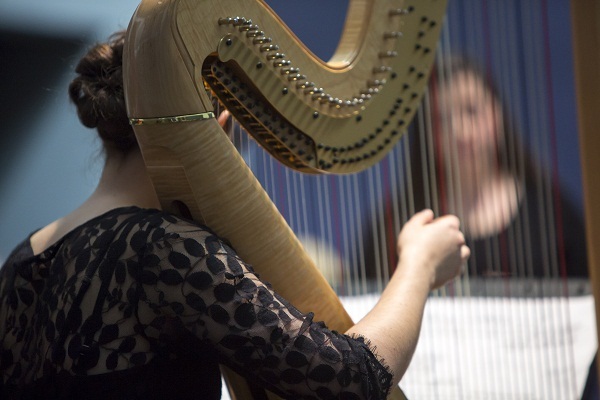 After the Holocaust Music Project’s success through the Da Camera of Houston Young Artist Program, Ms. Klein received a grant from the American Harp Society’s Grant Program to continue the project during the 2015-16 school year. Ms. Klein is also dedicated to bringing the harp to diverse audiences by bridging the gap between the visual arts and new music. She has performed at the Museum of Fine Arts Houston, Menil Collection, Rothko Chapel, and Houston area elementary schools. As an active freelance musician she has also performed with the Baton Rouge Symphony Orchestra and the Houston Grand Opera for their production of Das Rheingold. Competition credits include first-place in the Senior Division of the 2012 TexASTA Solo Competition, honorable mention at the 2011 Lyon and Healy Awards, and first place in the 2010 Mildred Milligan Harp Competition. Ms. Klein has also participated in prestigious summer festivals such as the National Orchestral Institute, Bowdoin International Music Festival, Round Top Festival Institute, Texas Music Festival, Castleton Festival, Chautauqua Music Festival, and Interlochen Arts Camp among others. In July 2012 she was awarded a Lovett Travel Fellowship to study the harp in Italy with Elisabeth Fontan-Binoche and Anna Loro. Ms. Klein is a native of Gladwyne, Pennsylvania and studied with Joan Raeburn Holland at Interlochen Arts Academy. Emily obtained her Bachelor’s and Master’s of Music degrees from the Shepherd School of Music at Rice University where she was a student of Paula Page, former Houston Symphony Principal Harpist. She was the recipient of the John E. Guida Foundation Full Tuition Scholarship and the Phyllis Burnell and Garrett Rezeau Tucker Endowed Scholarship in Music. Ms. Klein credits her beginning years of instruction and love for the instrument to her teachers Kimberly Rowe and Allison Reese, editors of Harp Column Magazine. Ms. Klein enjoys performing and teaching alike and maintains a private harp studio in Houston, TX in addition to serving as harp instructor at the High School for Performing and Visual Arts & American Festival of the Arts Summer Music Festival.